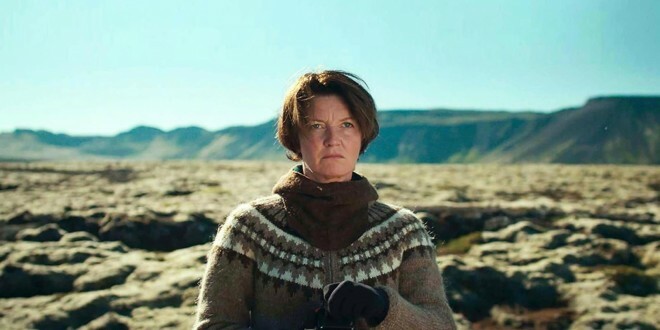 Deliciously quirky, fantastically off quilter, writer/director Benedikt Erlingsson teamed with stupefying actor Halldora Geirharosdottir, introduces viewers to a character(s) never to be duplicated or forgotten. Twins “Halla” and “Asa” approaching fifty are spiritual loaners; Halla a “Divine Demolition Diva”, an environmentalist, in Robin Hood style, single handedly slays the instruments threatening the ecological purity of her Icelandic landscape; we cheer her desecration; her day job as a choir director, adds hilarity to her every vandalistic endeavor; musicians, only she can see, like a Greek chorus, accompany every scene; her mission is interrupted when she learns that a long awaited child, (a four-year-old Ukrainian girl) is hers, if she commits immediately; shares the news with her twin Asa, who is venturing to an Ashram in India; what follows can only be defined as the epitome of cleverness; the strength of Geirharosdottir performance is Olympian. Classic comic relief escalates with a Spanish tourist, “Juan” (Juan Estrada), perpetually mistaken as the perpetrator of the technological sabotage; his unfrazzled composure, self-possession is an ingenious touch in “Woman at War”. Haunted by whimsical absurdity, a conflicted conscience, Halla/Asa, uniquely, without excessive license, are unabashedly figures of intense sagacity, sensitivity; happiness abounds in this colossal example of a auteur who has imbued his genre with magnificence.